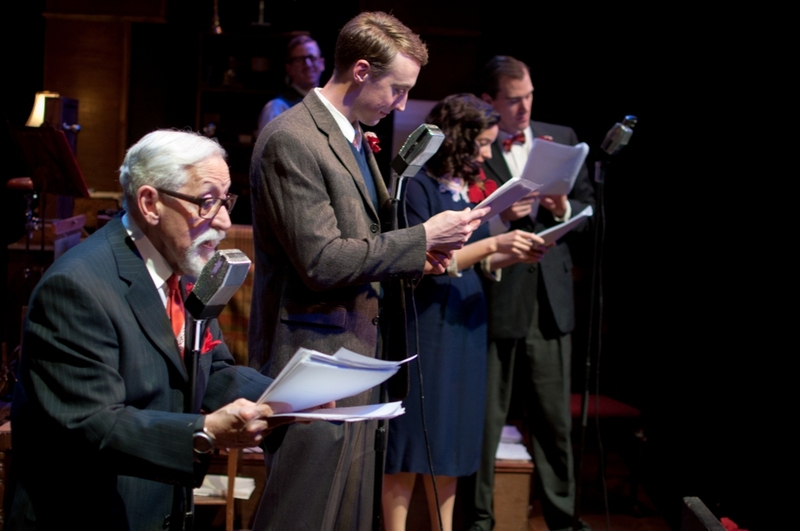 It’s moments like this that make this staged “radio play” version of Frank Capra’s It’s a Wonderful Life a worthwhile treat for the entire family, and explains why American Theater Company’s production is now enjoying its 10th annual performance. Ok, I’ve a confession: I’ve never actually seen the classic 1946 film starring the iconic James Stewart. I know, I know. And this was my first time seeing this radio play staging. So, as a “Wonderful Life” virgin, I was experiencing this story on a different level than probably 99 percent of the people in the theatre. While I was getting drawn into the story for the first time, most were probably enjoying discovering how their favorite holiday movie has been adapted for a 1940s radio play format, complete with Foley artistry (by Rick Kubes), applause signs and actors playing multiple roles (such as Margaret Graham who flips from vampy Violet, the neighborhood tramp, to Mr. and Mrs. Bailey’s youngest daughter Zuzu — the one who says that classic closing line about angels and wings). In the Jimmy Stewart role, fresh-faced Christopher McLinden has some big shoes to fill, but I think he did a very swell job, making us easily empathize with his plight to ensure his Building and Loan business doesn’t fall into bankruptcy (which is especially hard when $8,000 go missing), and cheering and tearing up when he discovers it is, indeed, a wonderful life! It’s a completely charming 80 minutes, and afterwords you can treat yourself and milk and cookies in the lobby. And, yes, the adorable Nussbaum does, in fact, get his wings. For more Chicago holiday theatre suggestions, check out last week’s post. This entry was posted in Arts/Culture/Entertainment, Theater and tagged American Theater Company, chicago, Christmas, Holiday, It's a Wonderful Life, theater, theatre. Bookmark the permalink.